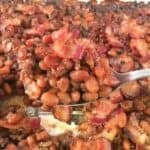 The ground beef makes this baked beans recipe hearty and the bacon gives it a wonderful smokey flavor. And of course, the brown sugar makes it all come together with just the right amount of sweetness. This baked bean recipe using canned beans will be your new go-to recipe because it’s just so simple. You and your guests will want seconds! This recipe is an easy side dish because there isn’t a lot of chopping involved. Use your kitchen scissors to chop the green onions and the bacon. Also, there aren’t a lot of complicated, unnecessary steps to follow. Who wants to deal with that. More than likely, if you’re making these baked beans, you have company coming over and you’ve got other things on your to-do list! So having an easy, delicious recipe like this is like having a gold mine. After browning the ground beef, add the remaining ingredients and pour into a large casserole dish. Top with bacon, and bake uncovered at 400 for about minutes. 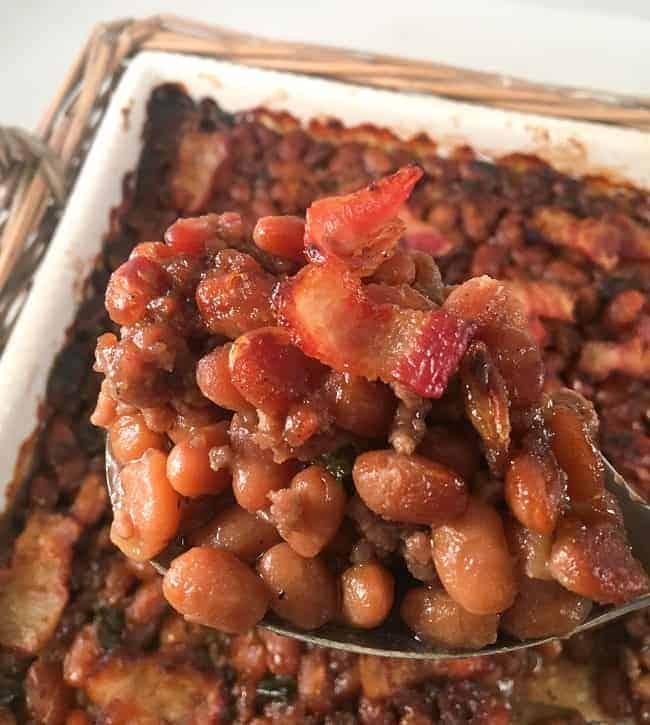 I would say this is a southern baked beans recipe because of the brown sugar, which adds a sweet, savory flair. However, using brown sugar could also be a personal preference, or a family tradition passed down from one generation to another. There are many delicious recipes for baked beans that use molasses or maple syrup. If you haven’t tried the brown sugar version, I encourage you to give it a try. The hamburger meat adds a hearty texture. And the bacon adds the smokey flavor. There’s no need to cook the bacon beforehand. It will cook in the oven and toward the end of the baking process, you’ll turn on the broiler to crisp the bacon. When you take these baked beans out of the oven, you’ll be very impatient to taste them! Be patient and let them cool a little bit as they will be boiling lava hot! And, oh the smell of these baked beans will make your mouth water. Sounds like a grand slam to me! Are Baked Beans with Ground Beef a Main Course or Side Dish? Well, it depends on who you ask as to whether this is a main course or a side dish. But here in the south, this is definitely a side dish! This year, we made these baked beans as a side dish for a Thanksgiving meal. These baked beans were served with smoked turkey, pork tenderloin, macaroni and cheese, sweet potato casserole, and yeast rolls. And man oh man, everybody was happily stuffed! 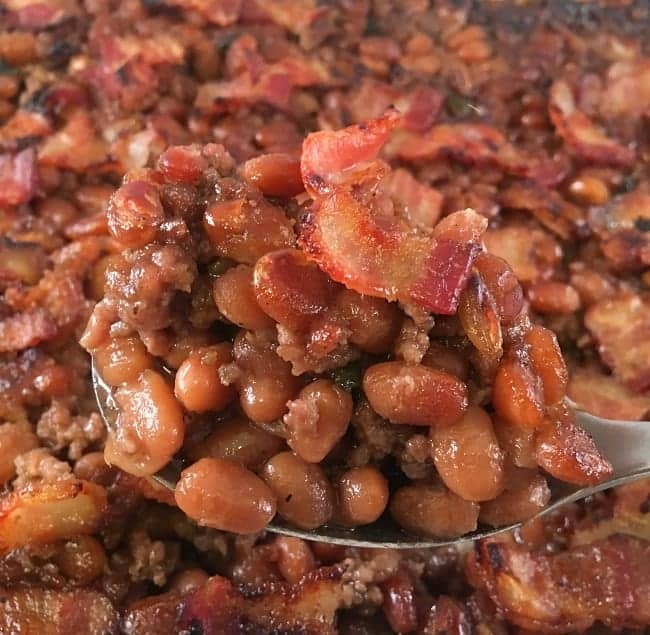 Savory baked beans with ground beef, brown sugar, and bacon. Brown the ground beef and drain off the fat. Add the dark brown sugar, green onions, worcestershire sauce, pepper, and salt. Mix well. Pour off and discard some of the liquid but don’t drain all the liquid from the canned beans. You want to pour off just the little bit of liquid that’s settled on top of the beans. Then add the canned beans and gently mix. Over mixing will cause the beans to get too soft and/or mushy. Pour into a large casserole dish. Lay the bacon strips on top. I prefer to chop the bacon first, with a pair of scissors. This makes serving the beans a lot easier as you don't have to fight with the bacon! Bake in the oven uncovered for about 30 minutes. Then, turn on the broiler and broil the baked beans for about 5 minutes to get the bacon nice and crispy. These baked beans are a perfect side dish for hamburgers or ribs. Every time I make these beans, people compliment them. Try them with my popular Ultimate Blue Cheese Stuffed Hamburgers recipe! Awesome guys. 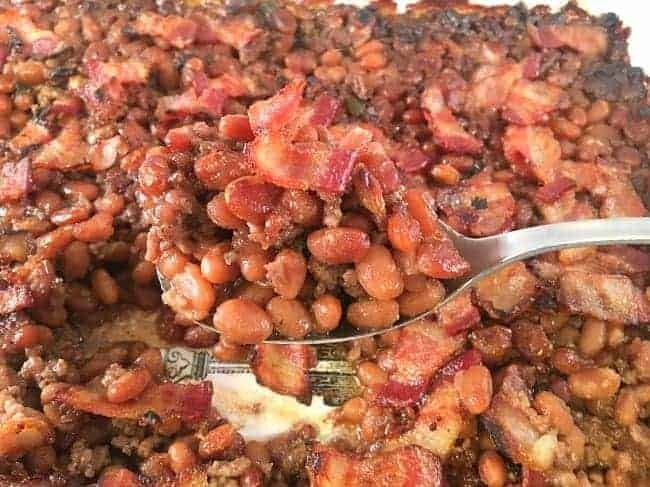 My mom made baked beans with bacon and maple syrup. I never heard of a ground beef combo but it sounds SO good. I need red meat about once a month after going largely vegetarian or sometimes vegan, with my veggie wife. A little iron boost goes a long way. Thanks, Ryan! MMM, maple syrup makes delicious baked beans as well! Adding ground beef to the baked beans creates a hearty side dish that could also be a main dish. Hope y’all are doing well. Take care!